Every so often I come across an author, whose books I have never read before. Janice Frost is such an author. When I was asked if I would like to take part in the blog tour for ‘Their Fatal Secrets’, I accepted because I knew that it would help me get to know the author as well as discover a new series. All I can say is wowzers what a book this is but more about that later. I must admit to liking the characters of DS Ava Merry and DI Jim Neal from the start. They are both ambitious, courageous and they don’t settle until they have solved the crime, arrested the perpetrators and achieved justice for the victims. If something doesn’t seem right to them then it usually isn’t. Both have feisty characters and although they sometimes might disagree over certain matters, each has the other’s back so to speak. The investigation takes many different twists and turns before a tense and shocking conclusion which sees DI Jim Neal left fighting for his life. As to whether or not he survives you are just going to have to read the book for yourselves to find out. I was a bit unsure of the new detective Tom Knight and I think it will take me a while to suss him out and see just what sort of detective he is going to make. 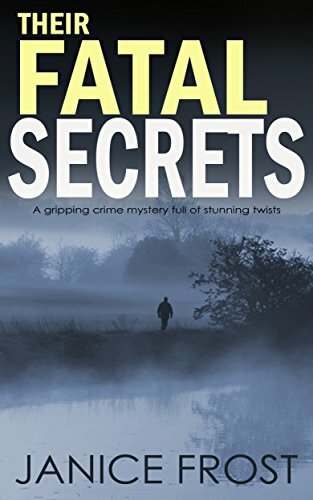 I have to say that ‘Their Fatal Secrets’ is superbly written. The murders take place towards the beginning of the book but the focus of the rest of the book is more on the police investigation, the suspects and their motives. This author grabbed my attention from the very first word on the very first page and I seemed almost hypnotised by the book because I just couldn’t put my Kindle down. No it wasn’t glued to my hand but I was so into the story and desperate for the police to catch the killers before any other victims were found, that the Kindle came everywhere with me. Reading ‘Their Fatal Secrets’ became an addiction to me. The pages were turning so quickly that it was almost as if they were turning themselves and before I knew it I had finished the book, which I was disappointed about because I was enjoying the writing style & the story so much that I just wanted it to continue. I loved the setting of the book in the East Midlands. I went to university in Nottingham and I still have family living in the East Midlands so in a way the dialect in the book felt a bit like going to my second home. I immediately felt comfortable there, even if the affectionate term ‘duck’ took a little getting used to. As I alluded to above the story has several twists and turns and there were certainly moments, where I feared for the safety of my favourite characters and I almost had to continue reading the book through my fingers because I genuinely feared what was going to happen next. This is actually the fourth novel in the series featuring DS Ava Merry and DI Jim Neal but it can easily be read as a standalone. The good and happy news for this Ginger Book Geek is that there are three more books out there with my name on, just waiting for me to buy them. I will definitely be buying them and diving in just so I can get to know DS Merry & DI Neal that bit better and learn a bit about their histories. In short, I absolutely adored reading this book and discovering a new author. I would recommend this series to anyone and everyone. I can’t wait to read what comes next from Janice Frost, but whilst I wait I will content myself with reading the first three in the Merry & Neal series. I give this book a well deserved 5* out of 5*.